Michael Georgiopoulos, a professor in UCF’s Department of Electrical Engineering and Computer Science, will become interim dean of the College of Engineering and Computer Science on July 1. 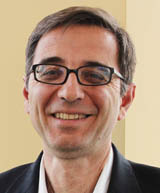 Georgiopoulos also serves as interim assistant vice president for the Division of Research and Commercialization. In 2010, he was named a UCF Pegasus Professor, the university’s most prestigious faculty award. In making the announcement, Tony G. Waldrop, provost and executive vice president, said Georgiopoulos has been with UCF since 1986 and his current research is focused on neural network algorithms. Georgiopoulos received his Ph.D. in electrical engineering from the University of Connecticut. He also has been engaged in research and retention experiences for undergraduate students. He has advised 16 Ph.D., 17 master’s and 67 undergraduate students. His research has yielded more than 260 articles in journals, book chapters and conference proceedings, and it has generated $13 million in funding during his time at UCF. A search committee is being formed to lead the national efforts in recruiting a new dean, Waldrop said.